As we draw smaller and smaller circles around our food community, we often forget the power of recipes to connect us to each other. Nancy’s â€œBenz Cakeâ€ recipes in her baker’s shorthand. Recipes in the personal sense. I’m not talking about the results of a keyword search or a formula in that latest best-selling cookbook, not the pasta-of-the-month at the back of a magazine or the marketing copy on the back of a box. Along with vegetables grown by farmers with real names and faces, a local food system includes dishes with memories of people we actually know. It’s difficult, I know. 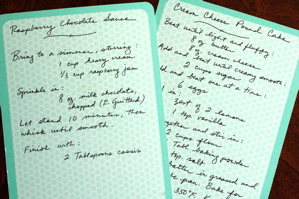 Epicurious is a bookmark in my browser, and one of my favorite pastimes is decorating cookbooks with little sticky notes. I can’t argue against the lure of convenience, the promise of infallibility or the excitement of the exotic. Like with many lessons in life, however, it took a hard loss to remind me of what’s important. 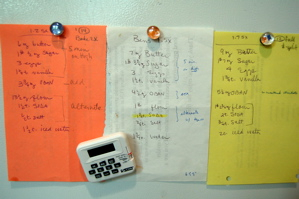 I took for granted personal recipes until that fateful day when I couldn’t find the torn, black pocket folder that had followed me from home to home. In it were recipes collected from years of Christmas cookie exchanges, letters from my mom transcribing dishes we ate together in Vietnam, my college roommate’s family’s tortillas, how to ferment injera from my DC neighbor, my babysitter’s microwave chile. Notes to myself, notes to share with others. Recipe cards sent — along with said cake and chocolate sauce — to celebrate a long-distance birthday. You don’t have to spend all your days in the kitchen to value recipes. We need kitchen messengers as much as we need cooks. The next time you hear yourself saying, â€œThis is soooo good!â€ ask for the recipe. Then pass it along, often and with love. It’s Mother’s Day. Ask the favorite mother in your life (yes, it’s not always our ownâ€¦) for her story of a dish, any dish. It could be a lifeline from the war ration years or a treasure enjoyed only once a year or the soup that gets her from Monday over Wednesday to Friday. Get the recipe and add it to your stash. Then someday soon, give it away. 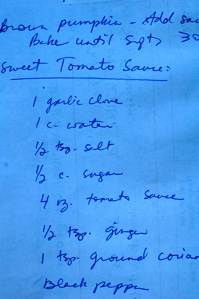 Notes on the back of a napkin, the curious cook’s antidote to NDAs.